blossom during an informational meeting at Country Flower Farms. MIDDLEFIELD, Conn. - Need an excuse to splurge? There are several new plant introductions being offered this year to the Connecticut market. 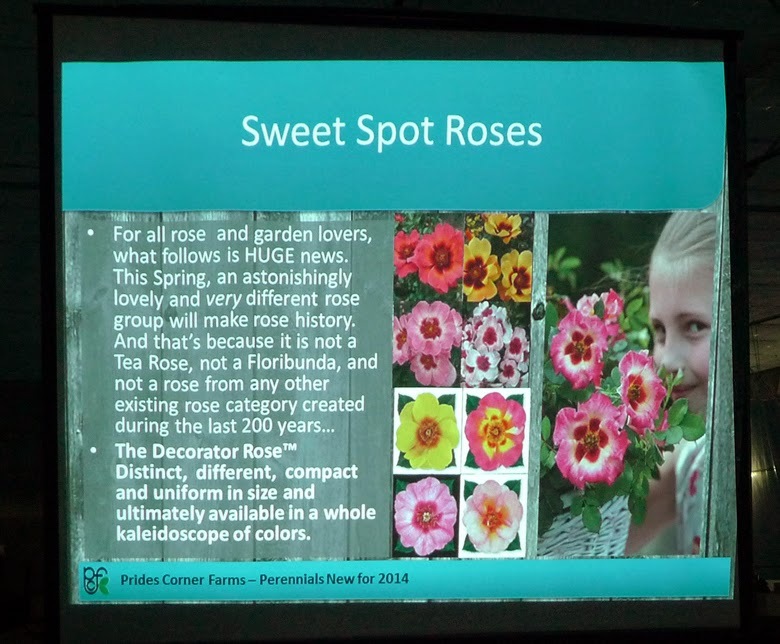 Chris Valley of Prides Corner Farms, Inc. (Lebanon, Conn.) recently visited Country Flower Farms to talk about 50 highlighted plants the wholesale nursery offers to retailers. Valley said he is part of the "what do we grow" team, which this year includes more than 200 varieties. Out of his 50 choices, I narrowed it down to these selections. A slide from Valley's presentation. Click to enlarge. Valley kicked off the slideshow with a tree: the coral-bark Japanese maple, which can grow 20 feet tall and is drought tolerant once established. Most people choose Japanese maples due to their red leaves, but with this tree, the bark overshadows the fall foliage factor. "It has spectacular bark color - a fiery red color - that stands out," he said. The leaves start out green and then turn gold in the fall. 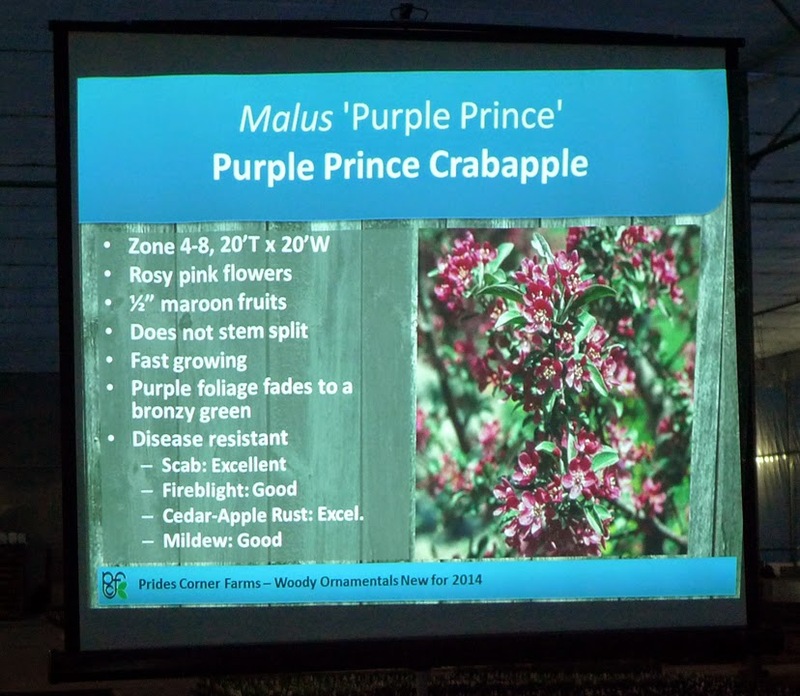 The Purple Prince Crabapple is a fast-growing tree which will eventually reach 20 feet tall and wide. It has rosy pink flowers and half inch diameter maroon fruit. "It doesn't get all the diseases apples typically get," said Valley. The purple leaves will fade to a bronzy green as the season progresses. 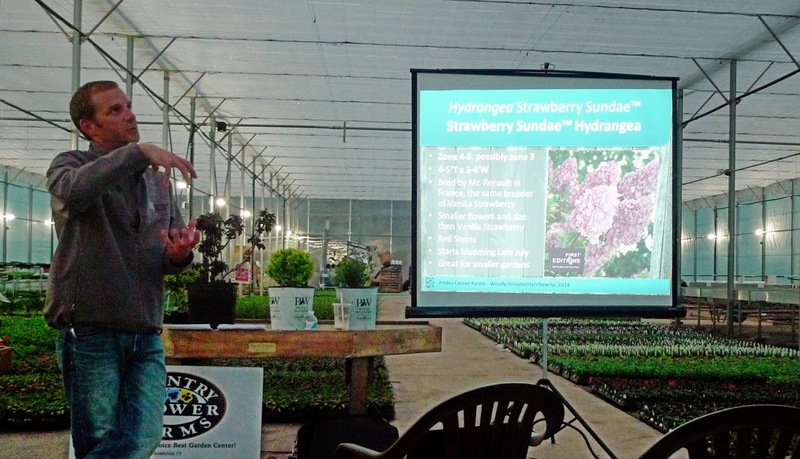 The Strawberry Sundae Hydrangea grows up to 5 feet tall and 4 feet wide, so it's a good choice for smaller gardens. "You can tuck this into a lot of spaces," Valley said. In addition, the florets on this hydrangea are "much more packed in" then other varieties. The flowers start off white, then progress to pink and finally turn to strawberry red. The stems also have a red hue. It does best in full sun. Valley said that Let's Dance Rhapsody in Blue Hydrangea is the "truest blue flower in all the hydrangeas we have. It produces twice as many flowers as Endless Summer." In addition, the flowers have a "neat geometric shape" contrasted with deep green leaves. It grows up to 3 feet tall and 4 feet wide. The Little Quick Fire Hydrangea blooms a month before other paniculata varieties. "Quick Fire is one of the prettiest paniculatas we grow. Flowers open all white and then turn to pinkish red. It has a nice mound of little flowers," Valley said. "It's perfect to tuck in next to your steps." The bush grows 2 feet tall and wide. The Bloom-a-thon Reblooming Azalea has two new colors this season - lavender and white. "The lavender has the biggest flower out of all four," he said. The previous two introductions were in red and pink. These azaleas bloom in April and then begin to flower again in July and continue until the fall. "There is a short window to prune it - right after it blooms in fall," he said. "The white is the slowest growing of all four." The azaleas will grow up to 4 feet tall. There are three colors in the InSpired Butterfly Bush: violet, pink and white. Valley noted that butterfly bushes can be invasive in most parts of the country, but this variety's flowers won't produce seeds. "We decided to go with the seedless butterfly bush. These are a little more fragrant. They have all of their foliage toward the bottom. It's a nice full plant all around and flowers all summer long." The violet version is the heaviest flowering of all the butterfly bushes they carry. "I've seen this in person -it's a crazy flowering machine," he said. The bushes can get up to 8 feet tall. The Purple Pearls Beautyberry (Callicarpa Purple Pearls) is a new release from Proven Winners. "This is one of my favorite new introductions," he said. " This is great for that late season color. And deer do not like this plant." The bush produces tiny pink flowers that turn into purple berries that stay on the plant throughout the fall. "The entire thing is purple - the leaves are tinged in dark purple. From afar, the whole plant looks pretty. This is a great plant. You should all have one." This callicarpa takes full to partial sun. The Snow White Mockorange is a repeat flowering bush. "When you see the flowers, it's remarkable," said Valley. "It has a nice sweet fragrance you can smell from afar." It will need at least half a day of full sun and will get to be 6 feet tall and 5 feet wide. Bonus: it also attracts butterflies. Blueberry Glaze is a new variety from the Brazel Berries line, which Valley said is perfect for the home gardener. "Now we are trying to incorporate them more into where you spend your time. It looks like a boxwood when not fruiting," he said. Growing to a maximum of 3 feet tall and wide, this edible can be grown in a large pot or as a hedge in the garden.